In 1868, the first illuminated traffic light was installed in London, England. The manually-operated pioneer traffic light was a basic device consisting of two gas lamps, one green and one red, and semaphore arms placed on top of a pole. But there was nothing much to celebrate at the traffic light’s inauguration as it blew up and killed a policeman when the lamps were being lit. Nevertheless, it inspired the creation of more efficient traffic signals and in 1914 the first electric traffic light was installed in Cleveland, Ohio. 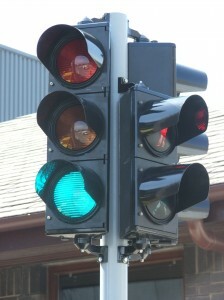 The electric traffic signal consisted of green and red light and a warning buzzer indicating when the signal was about to change. By 1918, traffic lights with the familiar red, green and yellow signals had been installed in the streets of New York City and Los Angeles. Modern traffic signals (stoplights) are used to control the traffic of vehicles passing through intersections with two or more roadways. The signals indicate to drivers when they should stop, slow down, make a turn or proceed; helping to prevent traffic congestion and to improve the safety of pedestrians and motorists. Modern traffic lights are operated using either simple timers that allow traffic flow for fixed periods of time or sophisticated electronic controllers that detect (sense) traffic flow and time of the day in order to adjust the sequence of operation according to demand. A modern traffic light system is made up of 3 basic subsystems: supporting poles (arms), signal light housing and electric controller. Signal lights and their housing are called the signal light head, with one head consisting of 3 lights: a green light on the bottom indicating that traffic can proceed, a red light on top indicating that traffic must stop, and a yellow light at the middle indicating that traffic should slow down and eventually stop. Every light is provided with a Fresnel lens which may be hooded or surrounded with a visor to make the light clearly visible in bright sunlight. Structurally, the outer surface of the Fresnel lens is made up of a string of concentric angled ridges which bend light into focus in a parallel beam. Since some road users are red-green colour blind, the lights are currently produced in a vertical head with the red on top so that the signals can be perceived by their positions and not by their colour. Similarly, light heads are usually supplied with dark-coloured backing plates to make the signal more prominent and distinguishable from the surrounding lights produced by buildings and road signs. Besides, every direction of every roadway is usually provided with one or more signal light heads. The supporting poles or arms are made of galvanized steel to provide the requisite corrosion-resistance and strength. The housing (body) of every signal stack light is made using moulded polycarbonate. The lamps used in traffic lights must be designed for long life and should be partially surrounded by polished metallic reflector which can direct the light forward. As leading traffic light suppliers, Automate utilise LED lamps which are much more reliable than bulb type lamps. In addition, our LEDs use central light source or CLS technology which produce one single super bright light. The lens of every light is made of plastic or tinted glass while the visor (hood) is made of moulded polycarbonate or aluminium. The electric controller is housed in and mounted in a steel weather-proof enclosure that is buried in one of the corners of an intersection. However, more complex traffic lights may have electromagnetic sensors buried at different points in the roadway. The controller must be supplied with relays, timers and switches purchased from trustworthy manufacturers. Copper wiring should be used to connect the electrical components and a heavy plastic or neoprene rubber insulation should be included in the system.